The State of the Impact Investing Marketplace: What is the Role of the Public and Nonprofit Sector, and Why? Some estimates put the potential size of the impact investing market at $1 trillion. And nonprofits and government are leading the pack in this marketplace. So why are the public and social sectors involved? And, is there a point of optimal facilitation of this market? What is social finance and, more specifically, impact investing? Social finance is nothing new. In recent decades, we’ve seen the fair-trade movement and the evolution of corporate social responsibility. Looking back further, the late 1900s brought environmental and social concerns motivating many investors to screen their investment pool to remove exposure to tobacco, firearms and alcohol, and push firms to track environmental and community impacts both positive and negative. And back even further: in the 1700s, Quakers prohibited their members from financial participation in the slave trade. As social finance evolves, we now see a large group of impact investors including foundations, venture philanthropies and even state and local governments entering the marketplace. They are using a wide variety of financial instruments—debt, equity, guarantees—to create financial returns with a social mission. And remarkably, governments, charitable foundations and philanthropists are often the first actors in this field. How is government facilitating impact investments? In 2013 the White House hosted the first meeting of the G8’s Social Impact Investment Task Force which aimed to “catalyze the development of the social impact investment market.” Subsequently, the United States Small Business Administration (SBA) increased its impact investment funds from $80 million to $150 million. The following year, the SBA Small Business Investment Company (SBIC) Impact Fund managed a $60 million loan guarantee for green base-of-the-pyramid focused businesses and field-building support for pay-for-success models. We now frequently see impact investments facilitated by municipal governments that provide property rights and rezoning to create spaces for infrastructure investments. Governments are also supporting this market through tax credits, supportive legislation and issuing debt often in the form of social impact bonds. How are nonprofits supporting this market? Private foundations are some of the most active first movers in impact investing – providing grant funds and “patient capital” (investments not expected to generate a quick return). One area of foundation activity has enormous potential to catalyze this market: mission related investments. The F.B. Heron Foundation is pioneering this field, and declared in 2014 that they would deploy all of their assets towards mission. In other words, rather than invest their endowment separately from their required mission-related minimum 5 percent distribution (typically grants), they will employ all their capital toward impact – endowment included. As we begin to see more and more foundations follow F.B. Heron’s lead, more than $500 billion in foundation assets nationwide could be unlocked and invested toward impact. Aside from direct funding (grants and investments), nonprofit entities are also providing technical assistance and helping to develop performance metrics for impact investments. Most notably, the Global Impact Investment Network (GIIN) has been a leader among nonprofit trade associations in the field, and its IRIS catalog of impact metrics stands apart as a significant tool for facilitating standardization of the market. Why facilitate impact investing? Estimates of the potential size of this market range from $400 billion to $1 trillion in invested capital. Governments, foundations and philanthropists have the capacity to be first movers in providing grant and first-loss capital to social enterprises in their early stages before they are ready for mainstream equity investments. Coupled with technical assistance, these social ventures can become financially viable, scale their operations, and eventually find venture capital and private equity investments. The facilitation of the impact investing marketplace by government and nonprofit entities is beginning to pay off: pension funds are moving slowly into the market, and public pressure is there. A 2012 UK survey of 4.5 million pension holders found that nearly half of respondents expected to have impact investments in their portfolios by 2014. In the US, Teachers Insurance Annuity Association of America (TIAA-CREF) now counts $1.1 billion in their own social impact portfolio. Large financial institutions have also entered the marketplace: Goldman Sachs, Morgan Stanley and Citi, to name a few. Is there an optimal point of facilitating this marketplace? Whenever government and nonprofits partner with the private sector, we must be careful to limit risk-bearing. If facilitation is too weak or too strong, or goes on for too long, there is a risk of loss of social benefit. Government and nonprofits must have an exit mechanism when acting as facilitator of these investments. In the same vein, an area calling for further exploration is the optimal level of facilitation of impact investments. 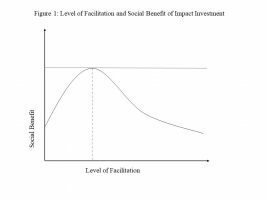 And if there is an optimal point of social benefit in this marketplace, there must be many points at which facilitation is less than optimal (see Figure 1). Nonprofits and especially the public sector must consistently evaluate the social benefit created by their facilitation. As the impact investment market moves closer to its estimated size, at least one researcher, Maximilian Martin, has postulated the potential for impact investing to evolve from its own category of investments into a style of investing. With this, the potential scale of impact is boundless. Author: Rebecca Tekula is the executive director of the Helene and Grant Wilson Center for Social Entrepreneurship and assistant professor in the Department of Public Administration at Pace University, NY. She can be reached at [email protected] and on Twitter @rebeccatekula or Pace_MPA.